Recently I was camping with my kids and so much of our food got soggy. So I went and discovered once and for all the ways to stop items getting wet and soggy in a cooler. The easiest and best ways to keep items dry in your cooler is to use a dry rack that elevates your food above the ice. Otherwise waterproof bags or plastic containers can be another great way to keep items away from the water. Draining the water as your ice melts or using bottles of frozen water instead of exposed ice can also help to stop your items from getting wet. A cooler tray is by far the easiest way to keep food dry inside a cooler. The tray generally sits at the top of the cooler and stops your items from coming in contact with the ice. Cooler trays can be made out of plastic or they are sometimes made out of a metal wire frame. I personally have a Yeti 45 and it came with a black metal cooler tray. Cooler trays are great but they can be extremely frustrating when your cooler is almost full. Ice often gets in the way underneath the cooler raising up the tray and meaning that you can’t close the lid properly. It also makes it hard to use the section directly under the tray because ice will naturally fill that space and as soon as you add any drinks or other frozen produce the tray no longer fits. So while trays aren’t perfect they are definitely the easiest solution and many coolers, especially the more expensive ones, come with a free tray anyway. The problem that I found with using waterproof bags is that the exterior of the bag’s gets extremely wet. This means when you open the bag to get the item out a little bit of water often gets in. This isn’t a problem for single use vegetables you might be cooking for dinner but when it comes to something like a block of cheese even just getting a little bit of water in there can ruin the entire block. So waterproof bags are great for keeping some items dry but they aren’t great for everything. Plastic Tupperware containers are a step up from waterproof bags. it’s much easier to keep the water out and they can sit directly on top of the ice meaning the lid doesn’t really get wet. The problem with plastic Tupperware containers is that they aren’t a very efficient use of space. Waterproof bags will mould to the size of your food but plastic containers are always the same size. So even if you only have a little bit of food left the containers can take up a lot of room making it hard to fit everything into your cooler. If you don’t mind your food getting a little bit wet then just resting it on top of the ice will keep it away from most of the water. For me I drink almond milk which comes in a wax cardboard container. This can get a little bit wet but if it’s sitting in water for a number of days then the entire container get soggy. So by resting it on top of the ice it still keeps a cold and yes it gets a little wet but it doesn’t get soggy. 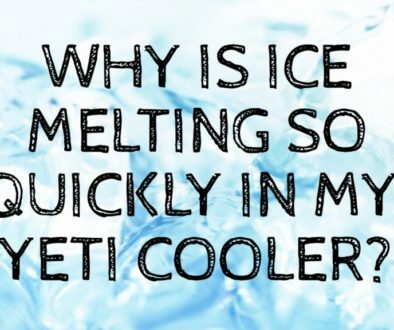 Often the issue of food getting extremely wet only occurs when a lot of your ice has melted and the food sinks into the cooler and is just submerged in water. If you’re on a campsite and your cooler is on the grass you can actually leave your drainage plug partially open so as the ice melts the water will trickle out of your cooler. however if your cooler is in a place where you don’t want it to be leaking water you can just empty it periodically as required. This isn’t perfect however as condensation does form around the bottles and if this comes in contact with your food then your food can get wet. using this strategy with something like a cooler tray or waterproof bags is a really good solution. If you don’t have a specified cooler tray then something as simple as a sheet of plastic or something like a chopping board can be placed on top of the ice in your cooler and then your dry food can be placed on top of that. This isn’t an ideal solution as whenever you need to get anything out that is below the tray you have to lift the entire tray up grab your item and then put the tray back down. But if you’re in a pinch and none of the other options are going to work for you then this can be a good quick solution for the short term. You know those watering crystals that people use in gardening that absorb water question mark well you can actually Place these crystals at the bottom of your cooler inside some fabric ( so they don’t go everywhere). then as the ice melts the crystals will absorb the water in your cooler. This is the equivalent of constantly draining your cooler only don’t have to worry about monitoring how much water is in your cooler as the crystals will just absorb the water as the ice melts. the downside of this is that it will take about 10 days for the water in the crystals to evaporate so that you can use them again. again this technique should be used in conjunction with other techniques mentioned above for the best results. 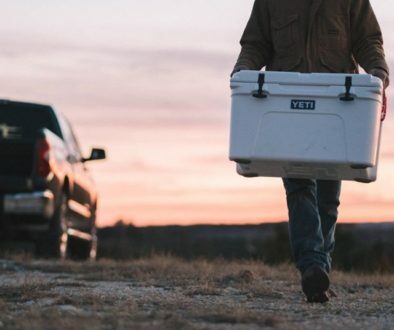 some coolers like the Yeti a designs so you can place a divider in the middle to have ice on one side and no ice on the other. 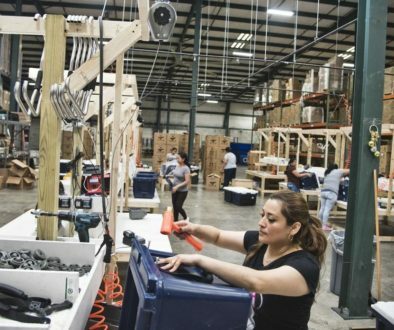 this allows you to have the items you need extremely cold in the ice on one side of the cooler and place dry items on the other side of the cooler. Most of it is aren’t designed to be completely watertight so you do need to be careful when using them. The best strategy is to place the ice on the same side as your drainage plug and place your food on the other side. then you will need to drain the water as the ice melts or you can use the watering Crystal technique mentioned above. the thing I love about using a divider is that there is no Juggling of items. You don’t need to lift up your tray of dry food in order to access your cold items below as you have easy access to your cold items on one side of the cooler and your dry items on the other side. Using a divider and then also using plastic containers is a near perfect strategy for stopping your food getting wet and soggy. it’s not the most efficient use of space and your ice retention will suffer as a result but it’s extremely practical and it works great. Dry ice Can be purchased from your local grocery or general merchandise store. Safeway, Walmart and Costco all tend to sell dry ice. Dry ice doesn’t last as long as regular ice and it’s all so much colder. This has the downside of if your food comes in contact with a dry ice it might not get soggy but it will likely freeze and no-one likes Frozen cheese. Dry ice is also more dangerous to use due to the extremely low temperatures so always wear gloves and safety goggles when handling dry ice. you also need to make sure that your cooler is dry ice compatible. Most of the more expensive rotomolded coolers like the Yeti are dry ice compatible but cheaper coolers may not be. For the best results you should be using a combination of the strategies mentioned above. some of the techniques like the cooler tray work well by themselves other techniques like the waterproof bags work better when combined with a divider or with draining your cooler on a regular basis. Each technique has its pros and cons and no technique is perfect. choose the strategies that are going to work best for you based on your cooler and the food you are trying to keep dry.